On Sunday, our day began before the sun was up. At 6:45 a.m. we were in route to the Georgia World Congress Center to join the 26,000 other American Society of Hematology (ASH) participants to learn about the latest developments in the world of blood cancers. Some of us took our seat in a large room for presentations which all fell under the title of Myeloma: Biology and Pathophysiology, excluding Therapy: Genomics. Wow – I knew from the outset that this was probably way over my head, but I was very curious. I listened intently as they discussed information on genotyping, clonal tracking, and genome sequencing. As they went through their presentations, using charts like this presented by Guangwu Guo, PhD of Dana-Farber Cancer Institute; I knew that I had no clue how to interpret this data. 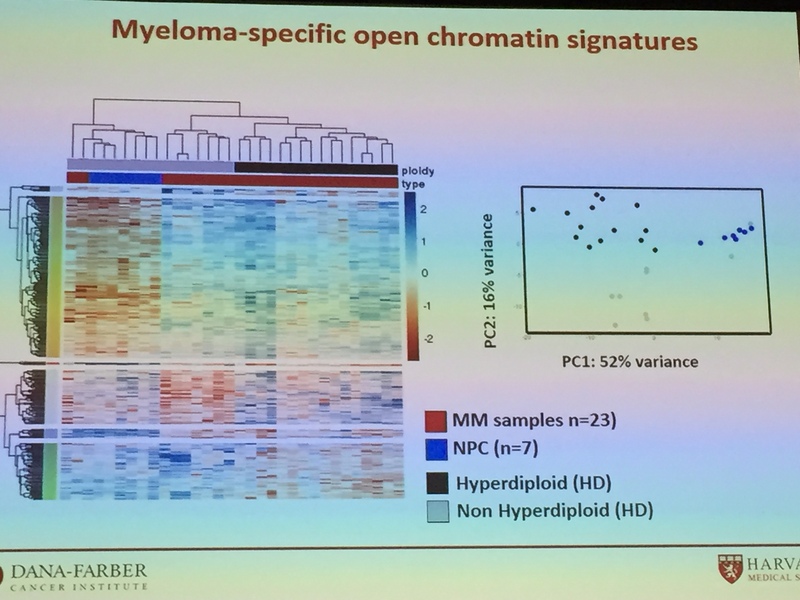 However, the big picture for me was that this type of research will eventually lead to more understanding of myeloma and more precision medicine. I’m grateful that there are people smart enough and interested enough in this type of information to pursue it. We know that not all myelomas are the same which is a huge part of the challenge in conquering it. It’s been reported that there are at least 12 subtypes. Each is a unique combination of genetic mutations. The more we understand each type of myeloma, the more we can tailor treatments to defeat it. One of the most challenging things for me as a patient is working with my doctors to decide which treatment(s) are best. Thankfully, we have multiple treatment options at each decision point, but this also brings about doubt as to what is the “right thing to do?” By understanding the exact type of myeloma and using the genomic information that these researchers are working on, there will be more clarity in this decision-making process. It will also bring about more treatments to match each type of myeloma and this benefits us all. After these sessions, I’m not sure I had any specific takeaways that I could truly understand, but I took comfort in the efforts of others that are leading us to a better understanding of myeloma and ever encouraged by the passion of the many researchers working to beat myeloma!